This month’s unemployment report was essentially the same as the last few dozen before it. Unemployment ticked slightly downward again, but much of that decline came from people “leaving” the labor force. Labor force participation peaked in the ’90’s and has been in decline ever since, but the aggregate numbers hide a long secular trend. We should be re-evaluating the emphasis we place on that metric as the meaning and significance of employment, both culturally and economically, has been changing for a very long time. When you look at employment statistics over the long term you see modern post-industrial capitalism at work, or perhaps more accurately – not at work. We’ve been measuring labor participation since the ’50’s. White males are the only segment of the workforce that has had full access to labor markets across that period, so looking at their participation rates gives the only indication of long term trends. Labor market participation by white males has been in steady decline for as long as we have measured it. Our workforce is shrinking because of a relentless rise of affluence and automation that has been in motion for centuries now. Menial work is steadily disappearing. The careers that remain available are generally much more highly compensated, start later and end earlier in life. In short, the most successful people in the work force are working less than ever. Fewer and fewer job options of any kind remain for those who do not snag one of those careers. US. Bureau of Labor Statistics, Civilian Labor Force Participation Rate [CIVPART], retrieved from FRED, Federal Reserve Bank of St. Louis https://research.stlouisfed.org/fred2/series/CIVPART/, December 10, 2014. It’s 9:33 and I’m typing. Tomorrow is 12/13/14. A disturbing thing, lately, has been the “Uncovering” of various bloggers. This is not good. Please stop. It sets a terrible precedent and is almost like having some idiot rifle through your garbage. I was wondering that also Captain. Looks like Harris County peaked in 1979 and has been downhill since then. Seems like some RWNJs gathered in front of the White House calling for the POTUS to be lynched. The “brains” of the bunch are speaking at the end of the video. Also, notice the gadsden flags in the crowd. Who here flies such a flag? Hmmmm….I just cannot seem to remember. In this case, “OT” stands for Over The Top. You seem to revel in raising red flags. As I posted below to Texan: I think giving so much attention to all the garbage played up in the news just breathes more life into it and causes it to become more important than it truly is or deserves to be. It needs to be ignored and thereby starved. I absolutely agree with that, Tutt. There are corners of human insanity that do not need to be illuminated. It’s relatively easy to find inflammatory and/or not very coherent speech….here? It’s crooksandliars existence to find the crazies and scare their audience. You’re very prescient again Chris. Or you bugged the NYT editors’ office? Can’t believe in man-made climate, but you can believe is this steaming pile of horseshit? My friend, complaining about it will not change things. Let it be. Or vote against it. Tutt, how does one vote against religious stupidity and/or dogma? Vote against the politicians who pander to them. Keep in mind, though, that the idea of karma is pretty powerful, and not just among religious extremists, and not necessarily about gays or abortion — the basic idea that what goes around comes around. And Jindal was the one who once said that the GOP needed to get rid of that sort of stupid, IIRC. Looks like it’s eaten his brain, too bad; he had potential. I think the female dog named karma is already at work when you consider LA’s economic situation. The skilled &educated people aren’t going to be wanting to go there. That headline is a little misleading, as I’m sure Jindal wouldn’t agree. (If he does, then “wow”). Falwell has been a fundie jackass forever, so I’m sure he’s not going to change. Keep in mind, these fundie waves correlate with times of great stress (like recessions), but overall, we are much more enlightened than we were 100 years ago. What about your own personal karma, Dow? I have a personal sense of karma — for example, that if I keep that extra $20 I found in the ATM, I deserve to lose something else as punishment. So whenever I find lost money, I always turn it in to the manager. Perhaps I’m overly conscientious. A Catholic guilt complex? Tutt, karma is my guiding force in life. My conscious will not allow me to be deceitful. Do the right thing is the only way to live. The lack of empathy is what missing in politics today. Texan, speaking of karma . . . I think giving so much attention to all the garbage played up in the news just breathes more life into and causes it to become more important than it truly is or deserves to be. It needs to be ignored and thereby starved. Falwell rose from the dead? I love that Fly and Crogged does not know that regularoty power, oversight and appropriationg comes from the legislature which the democrats had a SUPER majority a year before the crisis. But keep singing ‘la-la-la’ with your fingers in your ears. The stupid, it burns! So are you saying that the democrats in the legislature could have implemented the regulation needed to retroactively prevented the crisis that was already brewing? In a years time with the obstruction of the republicans? WTF is wrong with you. In July, Barney Frank went on record and said Fanny Mae and Freddy Mac were doing great and there were no problems at all. Countrywide Savings got a big boost of support from Dodd of course for a sweet pay out and then the crash. You my friend figure it out. I don’t think you’re able, but give it a try. When the GOP takes over both houses in January, I will keep a close watch on their actions also. I don’t have a dog in the hunt, I just want sanity to come to Washington. I don’t have a dog in the hunt, I just want sanity to come to Washington. Says the man who blames all the ills of America on the democrats on a daily basis. Buzzy claims that the Democrats in power for only one year should have stopped the financial crisis but the GOP with control of congress for over ten years, six of those years with a Republican President are totally excused from any expectation that they should have acted to protect the economy. Instead it was the fault of one man in the minority party. By the way is it the Democrats fault that the GOP added a rider to the new budget allowing the banks to return to the trading practices that caused the financial meltdown? I gotta admit you are one consistent hypocrite, so you got that going for you. Dumber than a sack of hammers, (my apologies to a sack of hammers). Isn’t this guy a TeaParty favorite. “After the “cromnibus” passed Thursday night, Rep. Marlin Stutzman, R-Ind., made the rather shocking claim that GOP leadership convinced him to vote for the rule allowing the bill to get to the floor by telling him they were pulling the bill anyway. Of course the democrats mantra ‘you have to pass the bill to read it’ is so Gruber. Kabuzz, you are such a one trick pony. Buzzy – In other words it is OK for for this tea bagger to not read a bill in his hand, but Pelosi should have used her “mind reading” powers to know what a Senate bill that had not been voted on contains. Is the little hooded kitty high on strawberry Quik today? Kabuzz, you know full well that quote was take completely out of context. That quote is as accurate as any you left wing nut jobs have posted of conservatives. Didn’t read it did you. Please provide one example of ANY misrepresentation that “you left wing nut jobs have posted of conservatives” here buzzy. This is where buzzy “conveniently” slinks away without a peep with his too tight hoodie between his legs. I happen to agree with Chris’ overall assessment, but the graph presented in support thereof is serendipitous at best. A great many factors play into the overall decline in the percentage of working white males other than ongoing automation. A few of these off the top of my head: 1) demographic change (‘graying’ of the baby boomer workforce) over time, 2) increasing competition for jobs by women and minorities, 3) systematic expansion of the entitlement state over time. Of more import are the sharp slope breaks in both the overall and white male work force participation curves that occur roughly coeval with the great recession. These suggest some overprinting factor having a sharp negative influence on work force participation. That negative influence can be summed up in two words: Obama administration. Oh, lord, Tracy. The graph traces the workforce participation of all adults over 20. The baby boomers started hitting their 60s in 2006. Combined with a recession, of course there has been a sharp drop since then. The Obama administration is hardly to blame for six decades of demography combined with a financial meltdown that was well under way when he took office. Let’s be reasonable, shall we? If only we could be prepping for the Sarah Palin run for the Presidency after President McCain overcame demographics and a recession with nationwide prayer rally. We vigorously agree-simplification leads to consequences which aren’t simple. What would those accountants, lawyers and white collar professionals do if taxes become lump sum obligations returned simply without strings? The U.S. National Bureau of Economic Research figures that the Great Recession stared in December 2007. So Obama has a time machine??????? But remember, Democrats won control of the Senate in 2006, passed some legislation in the 1990’s and Presidents Roosevelt in the 1930s and Wilson in the 1910s. See? Their fault. No TR it worked. I can see the time machine! Stylin’!!!! Weird…I do not see it in my chrome browser but I can see it on IE. And I just love how buzzy ignores all the fiscal irresponsibility and lack of oversight that happened BEFORE 2006. No actually I don’t. It just adds to the stupidity. Buzzy is a fine example of a partisan hack. Buzz, you’re right. Mere election of Democrats in 2006 caused a world wide collapse of real estate and financial markets. Well no, it didn’t, is was the 2006 election AND President’s Roosevelt and Wilson. And hippies in the Sixties with their free love and fluoridation of water and the rest of the welfare spewing progressives from the Granger movement in 1887 and…..excuse me, the nurse just popped into my room…. So you liberals are saying that the congress can pass a comprehensive, complicated and deceitful 2,000 page Obamacare bill in less than one year but they can’t oversee the working of the markets by their oversight. They can hold hearings on WMDs, Iraq, Plame, you name it but they can’t understand or do not want to understand the markets and the problems? I got it. Okay. No, we’re saying that your delusion that they did something so egregious in just one year that they tanked the world economy in batshit bonkers. Exactly what specific action or lack of action by that Congress did that much damage in so short a window of time? Take a pill, kids. Just pointing out that other factors are at play, not that they are necessarily O’s fault. The sharp increase in negative slope, however, I will lay at O’s feet. Oh, I see, ‘systematic expansion of the entitlement state’. Why work when you can live off of a 100 bucks a week unemployment, well for a year. Then there’s the food stamps and free food, and free medical care, if i live to 65. So yeah, dang state ruins ‘incentive’……..
And we did start this new way of providing medical insurance, where insurance providers compete for my ability to pay for a ‘bronze’ level of medical insurance. Lucky me, beneficiary of massive expansion of government enabled private enterprise market behemoth incentive killer. Um…Economic disincentives to work are real and must be taken into consideration in the design and administration of the programs that create them. Aren’t these only at the margin? I struggle to find an economic incentive for a middle class earner to drop out and still be able to maintain life style? I’ve known people who have consumed assets rather than take a large drop in income just to get up in the morning, go to Lowes and clock in. Such people are still productive, these assets they liquidate buy items which keep an economy moving. What am I missing? I couldn’t tell you what the Standard Deviation is for these things, the margin might be fairly small relative to the total population yet still be a large number. As we go forward I’m seeing just how much of my opinion could be malformed, or corrupted, by bad info, so I’m not interested in piling on all recipients of the American Gov’t largess. It isn’t just those evil poor people who are looting the US Treas, it’s the “legitimate” interests as well. TThor, I thought you were better that that to take an intellectually dishonest cheap shot. A zinging cheap shot I would find more palatable. So you really believe that NONE of the goofy Repub demanded and (received) counterintuitive screams for austerity, local, state, and Federal government layoffs, service reductions, salary reductions, on sided deficit reduction, AND tax cuts (re: revenue reductions) had NOTHING to do with the anemic recovery? How are the shining examples of economic austerity and retrenchment faring in Europe TThor? Man are you off your meds today Bubba. Wow! Thinking of you walking about free out in society is kind of scary. Quite the scintillating point by point rebuttal buzzy. But not surprising you have absolutely nothing intelligent or of value to say. Or maybe I should pull a quintessential buzzy and whine to Christ to have you banned or deleted? I know you had DanMan banned for very inappropriate behavior which is your call to make. But there is also a commenter that goes by the name of kabuzz that is equally if not more inappropriate then DanMan, yet you give him free reign. Why is that? Isn’t bad behavior bad behavior? I request you revisit this subject. My eyes are playing tricks on me this morning. I saw the letters SANTA on some website, but my brain must have scrambled them, because I saw the word SATAN. Well that’s understandable, they’re both clad in red and they have lists. I’ve had a similar experience with a certain fabric, thinking that must be one *hot* dress. Dow, you mean you’re a SATINIST?? I enjoy eating Thai food. That makes me a satay’n-ist. Speaking of the devil … hi Owl! Ewww, no I can’t even get a tattoo. I was joking about the cans; I figured some self-deprecating humor was in order. “Ruidoso” means noisy in Spanish. Dow, I just read the history of Ruidoso. Interesting! lol, yeah it doesn’t take long to read the history. I really enjoyed the little town of Lincoln too, most of the buildings are the same now as they were (except the roofs). They rebuilt an el Torrean (Indian lookout tower) that’s pretty cool, and they have a museum. You can even see the alleged bullet hole from when Billy escaped jail. ‘Cause when reality proves inconvenient, Tea Party types just decide to look at it sideways. I read that last night and I just let out a sigh. This type of scoring is what the result of a tea party types that do not comprehend economics and instead believe in fairy dust. Kansas is a great example of “conservative” economic policies put in place by tea party officials. As opposed to democrats outright lying to the CBO and the people to get the numbers and the support they wanted? Gruber was talking about people like you, Owl. And you say he is right. Apparently the current Tea Partisan response is to entirely ignore Kansas and the other repeated failures of “voodoo” supply-side economics, in favor of unintelligible grumbling about peripheral figures linked to the latest vivid conspiracy theory. Fantasy over facts, as usual. Captain, why do you waste your time with these two? It’s hard to take a Republican’s criticism on that seriously as long as they’re openly and transparently going to advocate methods that everybody knows produce distorted estimates. It’s just the latest step in the evolution of Republican mistruths, from Reagan’s “Ketchup is a vegetable” and “Trees cause pollution”, to redefinitions of poverty, to George W. Bush’s “Clear Skies” legislation that loosened emissions rules, to today. Yea!!! Now the entire country gets to look like Mississippi. Republicans crack me up. Listening to NPR this Am a republican was complaining about a federal land grab and how it violates individual property rights. That same republican is all for the Keystone pipeline that violates individual property rights. But Coburn is all for Keystone. Now if Coburn whats something that “ethically, it stinks” here it is. Here is the story, read it and weep. Is it all clean and well maintained? Are all of your underground services being looked after? Are all of your old and disabled people being looked after? Do your schools have all of the facilities and people that they need (Teacher aides..)? Yes, the upper classes don’t need water, sewer storm drains, bridges, etc. Give me a break. …the upper classes don’t need sewer storm drains, since they can afford to buy houses on lots that been illegally built up with fill dirt above neighboring areas (and overwhelming Harris County’s paltry inspection corps — see an old article at http://www.houstonpress.com/2001-12-20/news/out-of-control/full/ ). …the upper classes don’t need bridges, since they can afford to buy homes close in to town rather than at the end of long commutes that would require bridges. But acknowledging that would require honest and comprehensive thinking. And this is kabuzz we’re talking about. kabuzz, there really is something wrong with your brain. Get help. Acknowledging that both rich and poor benefit and are in need of the infrastructure. If a neighborhood allows their area to degrade as far as cleanliness, it is on them. We’ve spent decades now lazily living off the largess in infrastructure created by the massive expenditures of the New Deal and the Cold War, allowing bridges and buildings and other resources to decay without spending the money to keep them in good repair or build replacements. And much of the blame can be laid at the feet of taxophobic, short-sighted, modern conservatives. This is an excellent point, Duncan, and gets to what I think is a primary mistake made by the Tea Party, which is to not distinguish between “good” and “bad” government spending. Investments, whether they be in infrastructure, education, R&D, or other things, is good. The return on these investments is positive and widely benefits society. Houston, where I live, loses 15% of its water supply to leakage. That’s enough to supply 380,000 households. That factlet is just one of many neglected bits of infrastructure for which investment would be welcome. JG, again with your mischaracterizing TEA Party points. Most is focused on federal. Local government we all have more direct control and input into as with some state. For instance, if Mayor Parker suspended her HERO overreach it would stop the thousands of dollars it will cost our city to defend the law which we all know will probably fail anyway. That money can be put into the infrastructure. So, when you come to realize that the federal government is full of curruption and waste, well then we can talk. As long as you continue to support a broken system, it will go on. kabuzz, do you have a similar attitude toward the massive waste of state funds caused by Attorney General Abbott’s continuous, quixotic quests against the federal government? Or is this another example of your typical, careless hypocrisy? Why would HERO fail here, when similar ordinances have been in place for years (in Dallas, Austin, and San Antonio)? Ah, yes, Kabuzz, the crumbling infrastructure in Houston is due to an anti-discrimination ordinance. You have proven my point better than I could. JG are you just trying to act stupid. It is but ONE example. You liberals are a dense lot. So, kabuzz, since you’re wailing about waste from Parker’s HERO lawsuit, do you have a similar attitude toward the massive misdirection of state funds caused by Attorney General Abbott’s continuous, quixotic quests against the federal government? Or is that a question that you’re deliberately not answering? Buzzy – If there are other examples then why not use a more appropriate one. Also, please answer Owl’s legitimate question. A critical thing to recall-government money spent isn’t ‘wasted’ in the sense of money burned in barrels like trash. Government pays salaries, or buys goods and services. The purpose of the salary paid or the goods bought may not be what one desires, but the money enters the economy. So ‘cutting’ spending is taking money away from some folks who would spend the money elsewhere. We can choose to beggar ourselves and not have anything good, what good is your new larger account balance if you don’t have anything worth purchasing. In the link I posted it spoke of a liberal who learned to think more like an ‘engineer’-which in this context means to think beyond ‘debt is money owed and is bad’. A debt means someone is a creditor. To whom do we ‘owe’ our debt–oftentimes it’s ourselves and we would be better off to chill out about threatening to break each others arms over money we owe ourselves. I don’t see a lot of TPers arguing that the state of Texas should be spending more to compensate for the feds spending less. Quite the contrary, the common belief seems to be that government is bad at most all levels and that any tax is too much tax. Or have I missed some conservative call for more state-level infrastructure spending? And the fact that the epicenter seems to be Texas, despite NASA, oil companies and ‘fracking’, makes it absolutely maddening. Why go to the moon, what good did it do? And actually it’s ‘deep water’ technology which is more clearly driven by what NASA developed. The concept that government spending is bad appears to be the TP mantra, with a few testosterone-fueled exceptions like buying really big guns for the military. The concept that government spending is often inefficient, however, is a perfectly reasonable one. Proof is often not offered, though, for how one might build and pay for roads privately in a way more efficient. There is simply no way to run a water system that is not at some level a monopoly and our country does not have a great record with private monopolies being in the best interest of consumers. Some schools, particularly Catholic ones, seem to provide an excellent education for reasonable prices, but St. John’s and Kincaid (Houston’s two best private high schools) charge 2.5 times in tuition what HISD spends per pupil. I would argue that HISD schools that are allowed to be selective (as those two are), which virtually guarantees intense parental involvement, are just as good (think HSPVA, Debakey, Carnegie Vanguard). So, how much of the decline in the graph would be because of aging and social trends? I believe Pew Research looked at this issue recently and concluded that most of the decrease was due to the large increase in retired elderly people and the fact that young people were pushing off employment until after college/grad school. This is in the aggregate of course. The concerns you mention about outsourcing/automation, etc. could explain declines in individual traditional industries such as manufacturing, but in the aggregate are offset by the rise of new industries like computer technology. There’s definitely some merit in what you have to say. For example, the CIVPART measurement has a bottom age (16 or more), but no top, so it’s definitely been affected by changes in retirement numbers/expectations from the 1960s to today. However, computer technology doesn’t create enough new jobs to counteract declines in manufacturing. I agree that most of the newer jobs that are being created do not really match up in compensation and prestige with the jobs that existed beforehand (though it does not really show through on the chart above). But I’m still wondering if there aren’t any other explanations besides the automation and computers taking over explanations that Chris mentioned. For instance, it seems (backing up Chris’s earlier post about the asset market) that companies have found it easier or more profitable to simply push profits into the financial markets instead of using them to expand or engage in tangible and real projects and investment. Obviously, there are fewer people required to do derivative calculations than to manage and run expansion and new branches, so this might have an impact on employment and the number of jobs available. But, this of course raises questions of why this is occurring. Is it because they can’t get enough financing to back these projects (due to credit restrictions, a paranoid credit market, etc.)? Is there just a lack of good profitable ideas to invest in nowadays? Is it because a greater percentage of company ownership and stock ownership nowadays is composed of institutional investors (read: mutual funds an such) that only care about the stock price and couldn’t care less about what the company does otherwise? Is there a mismatch between the skillset of the new hires pool and what the company needs to accomplish projects? It will be interesting to see how technological innovation further changes the landscape. I’ve read that some believe that 3D printing could so radically change the economy that what we have today will be fundamentally unrecognizable. If the technology develops to the point where the average consumer can download and manufacture a complex product on the spot–if one day we can use 3D printers to make automobiles and personal appliances, etc, as some think we will–we’ll have made the manufacturing economy obsolete. Services like FedEx and UPS would be no longer useful. Moving consumer goods around the globe would be a thing of the past. That’s millions upon millions of jobs around the globe suddenly rendered obsolete. It’s a fanciful notion right now, but so much is totally normal to us today that would have been unimaginable when this country was founded. I wouldn’t discount anything. Knowledge is going to be everything. Small businesses could compete in ways they can’t right now. I’m imagining all those Etsy shops, except it will be individuals who sell cars and guns and washing machines they designed instead of just jewelry. I’m remembering the diversity of design aesthetics that sprung up when small shops were able to design and manufacture recumbent bicycles, or computer cases, and imagining it applied to automobiles and washing machines…. Bet this is news to lots of Texans. RoR – Really, is anyone really surprised Perry believes this. He is a fundie after all: To claim we should help the poor is Christian, to actually help the poor is SOCIALISM. Perry needs to ride off into the sunset. He is the typical politician who knows how to do only one thing: run for office, again and again. Living in Texas and watching and reading about him daily, I can reinforce the TPM article that Perry doesn’t grapple with income inequality or anything unless it plays to his base – and it ain’t poor people. Actually, it’s pretty amazing that he is exploring a presidential run again. The man is hopeless….or, is it hapless? No gravitas – all about show. Someone needs to tell him that horn-rimmed glasses don’t make a man smarter. What a bunch of commie crap. Everbody knows people aint working because Obama and the democrat party pay them to sit on the porch, drink 40’s, smoke weed, and wait on the government check every month. The only folks here that makes any sense are this Sternn guy and kabuzz. The rest of you is a bunch of kool aid drinking libs. Well I duh-clare, if it isn’t the most rootinist-tootinist Con this side of the Pecos! Yup, Be here at noon. You have asked Firefox to connect securely to goplifer.com, but we can’t confirm that your connection is secure. I re-booted and the message is gone now. Anyone else having a problem? log onto not long onto. I’d advise wearing a condom just in case. I dated in high school, so I’m often lost on the various comic, Dune, sci-fi, middle-earth, and other references many of you folks toss about. I’ve heard Stern reference a character from where nice screen name originated, but I never googled it. I clearly have a highly unnatural affiliation with Stern, but even I’m not posting videos about him. I’m now worried you are going to fill up a facebook page dedicated to him. By the way, I’m not convinced that Stern is not actually Lifer playing a long con and setting up an elaborate online persona years ago to serve as a future example of how conservatism lost its mind. Your words are harassment regarding sexual/affectional orientation and a crime against the illogical harmony of this workplace. Yes, I read it, “sexual/affectional orientation”………….. I don’t want to know and I don’t want anyone to tell me what they know about any individual behind words here. I didn’t know what the link was and made the mistake of opening it, shame on me. If anyone here goes off the deep end and continually writes abusive personal posts filled with f bombs or racist horseshit, I trust the website owner to block the offender to the best of his ability and not tell us. Worse, if someone tries to say who someone ‘really’ is, they better get kicked off sooner than that and the posts deleted. Which is my perspective and does not reflect on the National Football league and its affiliates and sponsors. Usage of my words is really a bad idea and words and descriptions of what i remember of endless baffling legal disclaimers is prohibited. Everyone here is ‘explaining’, but because good folk already know everything about everybody, the word becomes ‘describing’. I don’t like labels, but I’m glad the grocery store and pharmacy use them. Wish I had not let that domain name expire. Oh well, still got a few variations of it. How about Jeffrey? Isn’t that a variation you use? No, bird, it isn’t. And you didn’t even spell it correctly. Texan, it turns out you were mistaken. Cap is not the one we should be afraid of. And I am NOT referring to Crogged. That “Anonymous” wasn’t me; I take credit for my posts and points of view. But it speaks volumes that Sternn (or Jeffrey) is too incompetent to use the address-hiding features most domain registrars offer for free. And then he whines when people find the personal information he posted in obvious places online. Also, our supposedly virtuous Sternn apparently doesn’t give a damn about intellectual property. ‘Cause, y’know, that would be inconvenient. And that’s the basis for moral decisions in the Tea Party these days. Oh for gawd sakes, it’s not like Sternn’s real ID wasn’t common knowledge. If I remember correctly someone outted him some yrs ago on the Chron message boards. Yes, it was the bird then as well. BS Sternn, I bet you are just pointing the finger at Owl because he kicks your arse intelligence wise. Everyone knows who you are so what do you care? I’ve known for years and have laughed at your silly Capt. Sternn facade. I thought it was because your had not fully developed from childhood to adult yet. I’m not even upset or angry about it. Kabuzz and Juarez identified themselves by sharing their books. TThor now uses his name, and Lifer has always had his name out in the open. All this does it demonstrate how petty some people here have gotten, and this obsession with me has flown over the cuckoos nest. I probably have the most back-and-forth with Stern in this space, and I don’t have a clue who he is. I’ve done a complete and thorough psycho-analysis of him, but I don’t know who he is. How would you find out (I don’t want to know the answer to that question)? Why would you publicize it (Jesus, we should all be better than that)? And probably most importantly, why the hell would you try to find out in the first place? Seriously, who has that kind of time on their hands? If folks want to identify themselves, more power to them. Folks who identify other people should be not so politely asked to leave. LOL, don’t flatter yourself Sternn, nobody has an obsession with you outside of Tutt. BTW, my name is Clint, pleased to met you Jeffrey. Out of curiosity I googled Captian Sternn because I wanted to see what the cartoon character was. The video I posted came up, and when I watched it, I thought it described the Captain’s posting style to a tee. Art imitates life and all that. Check out Sternn’s humble Humble mobile home on Google Street View. As you would expect, he’s got a traitorous Confederate flag hanging limply over the porch. I leave comments about other traitorous and limp parts of Sternn to others. Owl…I generally love you buddy, but that is fucked up. Thanks, HT. You’re a class act. You, too, Crogged. JMHO but flying the confederate flag and griping and accusing everyone else being “racist” is what’s F-ed up. Thanks for that info Owl, I just lost all and any respect for Sternn and anyone associated with him. I did look up the address because I thought you were kidding, but you were not. I guess I’m just an optimistic old fool, people with whom I disagree have every right to be great people with their own beliefs. Yesterday I read the below………..yes, we are all guilty, all human and need to b r e a t h e.
“I used to endorse a particular brand of politics that is prevalent at McGill and in Montreal more widely. It is a fusion of a certain kind of anti-oppressive politics and a certain kind of radical leftist politics. This particular brand of politics begins with good intentions and noble causes, but metastasizes into a nightmare. In general, the activists involved are the nicest, most conscientious people you could hope to know. But at some point, they took a wrong turn, and their devotion to social justice led them down a dark path. Having been on both sides of the glass, I think I can bring some painful but necessary truth to light. HT, gets it, as do Dow and Crogged. Tutt is right about HT and I would extend that to Dow and Crogged. Sternn – Do you fly the gadsden flag in honor of the Miller couple that killed the Las Vegas police officers and draped that flag over their dead bodies? No, Turtles, never even heard of them. Nor did I ever support the Occupy movement or side with Mormons. Please do not call out the identities of others here without their permission. Some people value their privacy and it can be a safety issue as well. HT, Crogged and Dow are acting with class. We disagree politically for sure, but they understand our personal lives should just be that. I find it depressing and obsessive to track a commenters home address, google it and comment on the home. It is very creepy like perverted kind of creepy. We don’t have to agree but damn, respect people. There is an never any need for this. Chris Ladd should take a good long look at this personalization of commenters. Aren’t kabuzz and Sternn perennial demonstrators of all four such sins? Just by the way, RoR, Owl was the first to look up my domain name and out my identity. The bird says that he or she will own their words, so ask the fowl and find out for yourself. Or remain in deliberate ignorance. Agreed. Knowing Sternn’s identity adds nothing to this forum except for increasing the potential for personal invectives which, unfortunately, appeared almost immediately. Sternn adds nothing to this forum. Or, at least, nothing positive. Of course he adds something to this forum, Owl. He adds the voice of some proportion of the voting public who have a vastly different impression of this country and where it should be headed than you do. That you think he’s wrong about however many things do not change the fact that he is not alone and his vote counts as much as yours does. How do you understand the political forces at work in this country without understanding where Sternn and others like him are coming from? So your claim is that Sternn has some marginal usefulness to the discussion as an exhibit of sorts? Given his now frequent and hapless resort to repetition, I think we’ve probably observed him just about as much as is useful. Agreed, but some intellectually honesty from his end sure would help the discussions not implode so much. Whether someone is publicly IDed here or remains anonymous ought to be solely up to that individual. If you don’t want to tell, I’m not going to ask. Thank you as well, Turtles and Fly. This little episode shows that some people have class even though they disagree with me, sometimes strongly, while other have no class at all. I am not really surprised where the cards fell. Personally, the only reason why I have ever tried to understand Stern’s views is because I thought he possibly represented some of my loved ones views. I was relieved to hear my conservative family agree that his stated political views are as wacked out as I believe them to be. That being said I could care less to know the identity of the made up character known as Captain Stern. I am actually relieved that he is probably not a significant “voice of some proportion of the voting public”. I know a lot of conservatives, self described tea party advocates, and none of them believe such tripe as we should reverse segregation laws for being unconstitutional etc. I doubt the author of Stern’s character even believes the crap he spews. Maybe we should stop debating a made up character with made up arguments and start debating some real opposition. Nah, it will never happen. Keep on with insanity. So, Intrigued, you see no difference between a city owned and operated swimming pool in a city owned and operated park and the privately owned swimming pool in your neighbor’s privately owned back yard. You believe you are entitled access to that privately owned pool and you are entitled to force your neighbor’s to serve you against their will. I do and will continue to disagree with you and I will continue to support the civil rights of all against people like you that do not value the civil rights of others. Late to the game as I have been traveling and preoccupied with personal stuff the past two days, but I feel strongly and need to add my dos pesos. As much as Cappy drives me nuts with his topical/factual/logical dishonesty, he has not ventured into any egregious personal abuse requiring corrective moderator intervention or duplicitous online identity shenanigans (that I am aware of) so I’ll accept that at face value and unequivocally state that he does not deserve to have his personal information laid to bare against his wishes. Just like public leaders’ underage children are off limits, peer to peer online, unwarranted personal information disclosure should be off limits also. If Cap doesn’t out anyone else or stalks anyone creepily, then he deserves his anonymity respected if he wishes. I personally wouldn’t want my real ID revealed by someone just because they disagree with me politically so I would not wish it on anyone else of any stripe that is undeserving of it. That is a total unnecessary and unwarranted non sequitur. And I have already revealed myself at my choosing to those I wish to (and obviously trust) so It’s not like I’m totally anonymous, but I would not want that choice taken from me just because someone disagrees with me. And warranted or not, I do not trust the online universe enough to publicly disclose myself to all on the ether and would not want that choice made for me by someone I disagree with. So walk a mile in Cappy’s shoes. I wouldn’t wish on him what I don’t want to endure if he has never partaken in any witch hunt outings himself. That is totally inappropriate and unfair. I go and say your opinion adds something to this forum and you go and post nonsense like that. Serves me right. See, even JohnGalt believes in karma (“serves me right”). JohnGalt, whether Cap adds something of value to this forum is not really the point. The point is, no one really deserves to have their personal information shouted from the rooftops for the purpose of humiliation, just because the rooftop shouter doesn’t believe he adds anything to the forum, even if the information is out there. I can look up anyone in the white pages, or find the arrest record of someone in the court records online — after all, it is public information — but that doesn’t mean it’s appropriate for me to advertise that information online. It smacks of graffiti on a bathroom wall. I believe I posted earlier that I agree with that, Tutt. My last comment was a tongue-in-cheek response to the steaming pile of manure Sternn posted about civil rights legislation forcing people to let anyone use their pool, or some nonsense like that. JohnGalt, I understand, and I did see your defense of Cap. Thank you for that. It just seemed everyone got sidetracked by the question of whether Cap’s presence on this blog had any purpose, and for Owl, at least, his belief that Cap contributes nothing here was justification for attempting to humiliate him. Bubba, this is going to hurt me much worse than it will hurt you, but thank you for that. Not that any of you are defending me so much as the principle, but it is appreciated by me. John, it was about the only appropriate response to the garbage Intrigued posted towards me. I have never said that we should return to the days of forced segregation by law, nor do I support any such notion. Public places should be available to all and equal access. My issue is with private individuals, private property and private establishments. Sternn, as best I can tell from what you say, you are perfectly happy to condone discrimination, as long as it is not “official.” Let’s imagine the mythical town of Mayberry in which the Main street had a city hall and library that permitted black people to enter, surrounded by dozens of privately owned businesses – restaurants, legal offices, pharmacies, book stores, etc. The owners of these businesses exercise their rights as citizens to associate with only those people they please in their public (business) and personal (private) lives and decide to not serve black people. Effectively Mayberry has no public accommodations for a portion of its population. Is this fiction? No, this is most places in the south pre-1970. Is this the place in which you want to live? Ah, the real issue is, how does one define “economic success”? Then, explain more about your theory of how America adapts our culture with the economy that we have. Finally, what will the transition process look like and how will the changes impact traditional gender roles as well as livelihoods? Looking at the chart provided above by Capt Sternn, women are on an upward employment trend even as their compensation levels currently lag. Males are in a descending track. Real wages have been in a decline for three decades. America’s middle class is struggling mightily to provide for themselves and their families. How will this shift to a different culture impact this group? Will they be better off or lose more ground? Access and personal responsibility for preparing ourselves and our children for a different economic culture face many bumps along the road. The huge financial and cultural divide we are witnessing will not make it easier, even if it is inevitable. What needs to be done on a personal level to prepare? Great question, and I’m sure the answers vary. For our family, we define it as “not having to eat cat food during our retirement years”. Which basically means make enough money so that we can take care of ourselves, with or without the government. In a formula, it would look like this: Retirement Goal = (90% current annual expenses) / 2%. We never include social security in our formula. But then again, if everyone did what we did, companies like Apple would go bankrupt. On second thought, we should continue to preach consumerism (via browbeating with ads) without fiscal responsibility (balanced checkbooks are for losers), at least until we retire! That’s the ideal plan – save enough, spend wisely – As one with an I-phone 3, I get it. The flaw is that life intervenes in ways we can’t plan for…..health issues, children’s needs, divorces, layoffs, etc. That’s when you find out if your plan will work. For educated white folks, there is a better shot at overcoming surprises. For many, earning enough to responsibly care for oneself and family is challenging. Saving on top of meeting basic shelter, food, and education/health needs is really tough. Without pontificating, those who are successful in their economic plan need to be more sensitive to those for whom day to day survival is really tough. The old, “walk in my shoes a mile” adage. Kudos to our young people for shaking things up! America is changing. Bravo! It’s about time. Now, if we old white folks will just start listening, things will really get interesting. Dow, like you, I’m kind of a non-consumer. I used to tell people all I needed for retirement was a bicycle and a library card. But it’s more than just “not eating cat food.” I can’t say for sure what else, but I love to go hear live music, and I wouldn’t feel right if I didn’t have something for the tip jar. Don’t worry, we have an annual JazzFest visit in our plan! Absolutely Owl, I was bummed that we couldn’t make your Macbeth performance. Heh, you’re too kind. I’m now working on the production side (backstage rather than onstage) for Rice’s spring production of *Measure for Measure*, which is one of Shakespeare’s less-performed comedies. The language and concerns of the play seem particularly relevant to the current day, if you give half a second’s attention to Dan Patrick or kabuzz. Dates will be March 12–14 and 19–21 (Thursday through Saturday). Of course, I’m not entirely sure whether it will be any *good* yet, but you have notice. Now that is a typical GOP reflection; white males. You could at least pretend that you see other people in the workforce and that labor issues are a little more complicated than just for white males. Stats or not, just more racism and sexism – and not so subtle. Racism is in fact the reason for using white males as a metric, but not in the context you are seeing. If you follow those metrics back past the ’90’s you get results that are hopelessly skewed by racism – the institutional barriers that blocked access to labor markets by women, blacks and hispanics. What’s interesting about the figures when you break them out by demographics is that participation numbers rose steeply for marginalized groups across the 70’s-’90’s, then peaked very recently. This reflects the new access to labor markets created by the removal of race and gender barriers. Once the impact of those barriers was removed and those groups had more complete access, their labor participation rates slowly began to reflect the larger secular trend. We have done this one before, Lifer. Participation is done in almost all categories and across all races. Oh, numbers are so frustrating aren’t they? Don’t worry, there are no objective metrics that can successfully challenge the things you know in your heart to be true. I used your own choice of web site to pull up the graphs and post the results. It has been some time ago. Maybe you think conservatives have short memories? I will look for you older entry later, maybe. Or maybe it will be easier to simply go back to your own source and post the results all over again. He has weapons and a CHL. It was back in October. Stern, what part of that graph are you not understanding in relations to Lifer’s point? Dealing with employment related statistics is kinda my thing, but it is certainly possible that I’m completely misinterpreting those data, so I’m looking forward to your assistance. Sternn produces a graph that supports GOPlifer’s claim that workforce participation is decreasing among all groups (notice downward slope) and somehow it proves Chris is wrong. Sternn – What the heck is your point, not that you ever have one. So, like I said, workforce participation for everyone peaked in the late 90’s-early ’00’s, depending on demographic group. What phantoms are you seeing in that picture? Is there actually some disagreement about whether women and African-Americans had the same access to the workforce as white men in the 50’s? WTF? We have a cat talking about racism in a post about the long-term trend in employment participation rates. Fortunately, this cat never rails against “the left” for constantly bringing up race. Anemia is having low levels of iron…we need a term for having a low level of irony awareness. The cat probably thought Alanis Morissette really was singing about ironic things. I will never understand the automatic fight or flight response the cat has when he sees data. Everyone should have a healthy dose of skepticism when looking at published data, but you guys act like math beat you up and stole your lunch money when you were kids. These. Are. Words. Write. Words. About. Point. You. Wish. To. Make. Or quote it back to me, the clever obscurantist way. Buzz…bless your heart, you are getting your talking points confused. Lifer is using this post to promote socialism/communism, not a discussion of racism. His focus today is on giving everyone heaps of money so they can sit around eating cheetos and playing video games without working. We’ll get back to our regularly schedule racism discussion tomorrow, but today is all about socialism/communism. 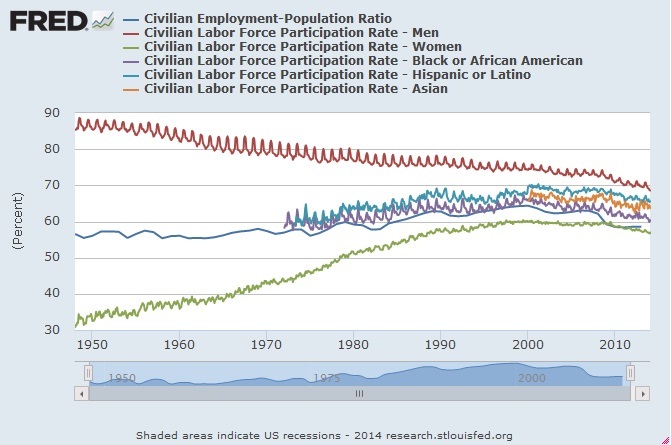 The reason to use White men in the discussion is to highlight the very long trend in decreased participation in the workforce. Pale folks with penises are the only group that has continued access to all aspects of the labor market since the 50s, so that is the best way to show the trend. As you like to point out, everyone now has equal opportunity (not true, but let’s go with it), so now we are seeing a decrease in everyone’s trend because this is a big macro issue that is only going to get more pronounced over time. As Barbie used to say, “math is hard”. Well Homer, Sternn regularly proclaims he knows more about how science is actually done than people like me and JohnGalt (who have decades of experience doing just that for a living), even though he displays the knowledge level of someone who took the minimum to get through high school (or less). So why should you be exempt, even in the face of his total inadequacy with math? Lets not forget his expertise extends to also understanding constitutional law better than any Supreme Court Justice. Then there is his unmatched knowledge of historical events – factual and fantasy. We should be honored that he shares his pearls of ….oh heck I cannot even complete that sentence. Homer, bless your heart, GOPLifer brought up racism dude. Not me. It’s almost always you, kabuzz. You’re just too self-involved to see it. #1 economic problem of our times, and it’s not overrated. Only if employment, as we have always defined it, and economic success are still linked. I don’t think they are. The era when we expected people to earn a living with a “job” didn’t really start in the US until the second half of the 19th century. And now it’s over. Rather than try to contort the economy to create something it no longer demands, it might be wise to pivot and start adapting our culture to what the economy has provided. Do you have thoughts on how we might do this? Are there other countries that have already started trying to adapt? The biggest single cultural/economic adaptation we need is to stop expecting that people will enter the workforce at 18. High earning professionals are seldom consistently in the workforce before about 26-30. This creates a serious problem in which lower income families lack the resource to support their kids through that long launch across the 20’s. At a policy level this means decoupling employment from the whole range of social safety net elements. Health care in particular needs to be tax funded rather than tax-subsidized. It can still be private, as in France and Holland, but if even a very lucractive career is only 20-25 years long, tying health care to employment is ridiculous. We probably need a lot more energy and resources devoted to community college and junior college systems. There’s good reason to think that we’ll never get more than a third to maybe forty percent of young people completing a traditional college education. Taking those numbers higher probably would mean changing the college experience in detrimental ways. Community colleges provide access to the first rung of the career ladder for a lot of people who would otherwise have no options. It also probably means dropping the whole notion of a merit-based social safety net administered by hundreds of thousands of bureacrats whose job is to determine who deserves help. Replace it with a simple, flat minimum income that is automatically distributed to anyone whose wage withholding drops below a certain threshold in a given month, or something similar. This is a transition every bit as dramatic as the industrial revolution, but it is being compressed into the space of a few decades. Very challenging environment for adaptation. I’ve been thinking about this for some time. In fact, professionals aren’t exempt from having their jobs eliminated by technology. The earliest automation replaced jobs in the agricultural sector. At the same time, lots of jobs opened up in manufacturing. With the union transformation in the 1930s, these became well-paying jobs that opened up a middle-class lifestyle for a lot of blue-collar workers (including my father). The second wave replaced jobs in manufacturing. Jobs opened up in services, but many of these were lower-paying. Computerized automation and artificial intelligence kill jobs in the service sector, too. After that, there’s nowhere to go, no area where good jobs can open up. There is software out there right now that can do everything a lawyer can do except appear in court. It’s threatening the jobs of paralegals, legal researchers, and associate attorneys. There’s software that can diagnose illnesses, and robots that can do surgery. Every part of a doctor’s job except a bedside manner can be automated now. Even creative work can be automated, although that software still hasn’t reached its potential. We are rapidly on our way to a work-free economy. That could be a great thing or it could be a permanent collapse, depending on how we distribute the wealth produced. The richest of us could end up cannibalizing vast quantities of robot-made, unsellable goods, unsellable because no one has the money to buy them, because no one has a job, and no alternative source of income has arisen in our economy. One stop-gap measure would be to continue the work from early in the twentieth century that led to the 40-hour work work, and continue to shorten expected working hours. In Europe, companies have to pay overtime to even salaried employees in many cases. Here in the U.S., not so much, and look at the horror stories that happen to, say, video-game programmers on continuous, never-ending deadlines. Rather than hire more workers (which would be good for the economy), companies try to grind more work out of those they have, without having to pay for it.